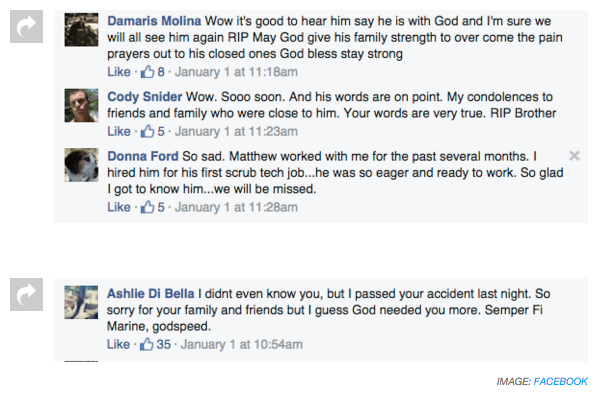 A man’s last ever Facebook post has gone viral after his death. Matthew DeRemer from Seminole, Florida was killed in a car accident on New Years Eve. The 31-year-old was killed by a drunk driver while riding his motorcycle through an intersection. According to the police report he was killed by Steven Lee Clarke, a 59-year-old, who turned left into the motorbikes path. Clarke has since been arrested on manslaughter charges. A day earlier, DeRemer wrote a Facebook post that has now been shared and liked thousands of times. In the comment section DeRemer’s friends shared their memories of him and discussed how inspiring his final message was. It’s easy to forget how quickly life can be taken away. It’s so important that we live every moment to the full and remember how lucky we are to be on this planet. We send our condolences to Matthew’s family, he sounds like a remarkable chap. Next articleRiddle Finally Solved: Dogs Should Wear Pants Like This!